Refresh yourself in His glory "The glory of this latter temple shall be greater than the former," says the Lord of hosts. "And in this place I will give peace," says the Lord of hosts (Haggai 2: 9). Fifty years after the last great miracle revival, believers of every Christian denomination are experiencing a restoration. As foretold by the prophets, this rain is resulting in the greatest harvest of souls the world has ever known. What took centuries to understand and accomplish, God is doing in an instant in this present glory. Mysteries are being unveiled now to those who seek the knowledge of God's glory. "There were many healings and miracles demon??? ?strated publicly each night????? ?Deaf ears opened. Paralyzed people were healed. Many with incurable diseases and serious cancers were healed. Every type of miracle was seen." Hungry believers will be fed through the Mysteries of the Glory Unveiled. 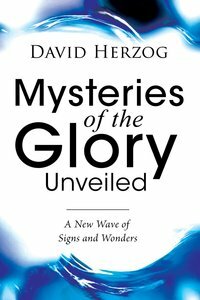 About "Mysteries of the Glory Unveiled"
Herzog is a graduate of Christ for the Nations Institute in Dallas, Texas. He is a missionary evangelist to the nations.